Although I wrote everything I know about squirrel issues for this website, oftentimes a problem with squirrels in the attic is beyond the scope of the do-it-yourself homeowner to solve. I have found a professional company in St. Louis, Missouri that handles problems with wildlife. 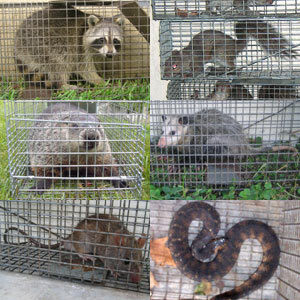 Wildlife Command Center has access to tools, techniques, and experience that help them do a far better job at wildlife removal than a non-experienced homeowner could. They possess licensing that allows them to do certain types of work legally, that non-licensed homeowners in the state of Missouri are not allowed to do. For the welfare of your situation, and the squirrels, in some cases it's best to hire a pro. There are good companies and bad companies out there. I've done research on such companies, to get to know them, and feel confident recommending their services. I therefore recommend a company called Wildlife Command Center which services St. Louis, Missouri. If you have a squirrel problem, or any other conflict with a wild animal, and live in St. Louis, I am confident that this company, Wildlife Command Center, is the one to call. I asked the company to describe their service range, and they said this - In addition to Saint Louis, we sevice towns and suburbs from Saint Peters, Saint Charles, Bridgeton, Florissant, Chesterfield, Maryland Heights, Ballwin, Kirkwood, Webster Groves, Mehlville, and in Illinois, Alton, Edwardsville, Collinsville, and more. Wildlife Command Center operates 24/7, so don't hesitate to call at any time to discuss your wildlife problem, and schedule an appointment for same-day or next-day service. It's unusual to catch birds in cage traps, but maybe it's more common in St. Louis. A good wildlife expert should be able to inspect the entire building and make sure that it's squirrel-proof. It's not hard to do. Then a one-way exit door on that opening, and your problem is solved. If you want help, my good friend Kris can do it. Thanks David. I have a call in to Arthur. Hello David, I've been hearing scratching noises coming from the ceiling in the morning and evening. I've located one of the holes where the I believe thee squirrels are entering the house from though I can't find a second hole. I was wondering how much would it cost to get them removed by your service as I am interested in getting the squirrels removed without causing them any harm. Hi David, I have been noticing an elevating ammonia smell in our 52 year old house the last year or so. I don't see any markings or entry points to our attic and don't hear any activity up there but am worried about going up there unprepared and untrained. Perhaps it is just wet insulation but I want to be sure. Can you help soon? If you have a squirrel problem in Saint Louis County Missouri, or any other conflict with a wild animal, I am confident that we can solve it. We use humane methods when dealing with St. Louis wildlife removal situations. Squirrel Control St. Louis. Our company is fully licensed and insured in Missouri. Call us any time at 314-255-1304 for a price quote and to schedule a same-day or next-day appointment to solve your squirrel problem in St. Louis.